Identify and recognize the characteristics of large-format, half-inch-thick porcelain slabs as defined by industry standards. Explain the life cycle of porcelain slabs from raw material extraction through manufacturing, building installation and use, and end of service life. Assess the safety and functional contributions of large-format porcelain slabs for both interior and exterior surface treatments. 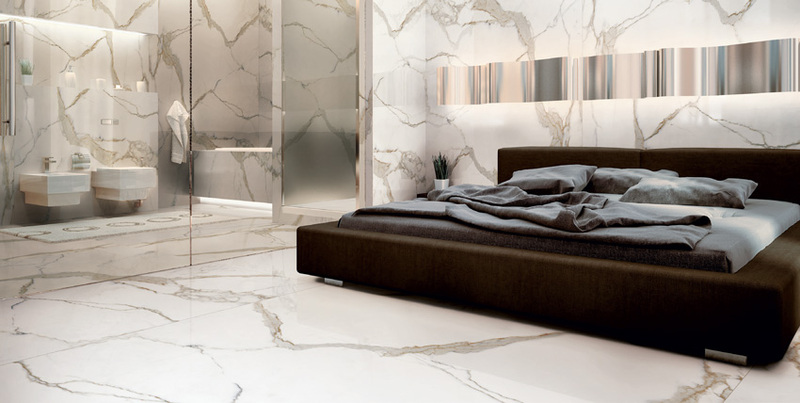 Specify porcelain slabs in a variety of new and renovated buildings, and make appropriate selections related to specific applications. When it comes to selecting materials for building surfaces, a number of factors come into the decision-making process. The appearance of the material and the way it fits with an overall design scheme is often paramount, but so is the durability and strength of the material. Special uses may dictate the need for easy-to-clean surfaces or even hygienic surfaces if used in kitchen and bathroom areas. And of course, the material has to fit within the overall project budget. Among the choices, porcelain ceramic tile is often selected for its ability to meet all of these criteria, particularly in areas that are heavily used or require clean and hygienic surfaces. One of its historical drawbacks, however, has been its comparatively small size, which necessitates grouted joints to take up a fair amount of a floor or wall area. The grout can be susceptible to damage or the promotion of organic growth if not maintained properly. However, this limitation, and others, have been overcome with the recent availability of large-size porcelain slab panels that can be specified in sizes to match or exceed large sheet stock products. These large but relatively thin (half-inch) porcelain slabs retain all of the superior characteristics of porcelain tile plus add new ones, such as the ability to simulate natural stone, wood, and other materials. In this course, we will take a closer look at this innovative update on a well-known and proven material that is suitable for a wide variety of both indoor and outdoor applications. 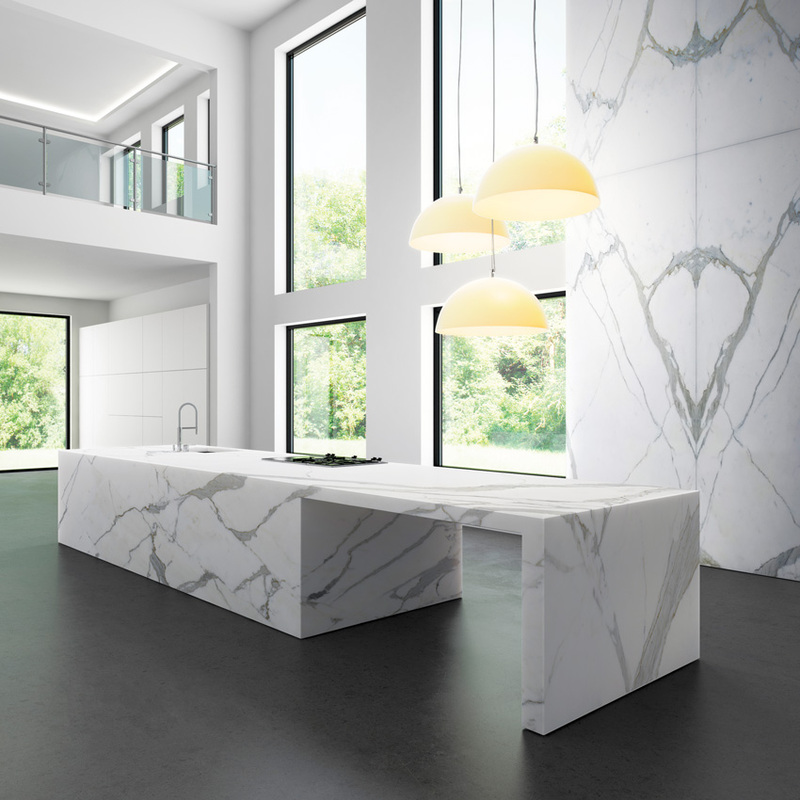 Large-size, thin porcelain slabs are now available in the United States, offering dramatic looks for interior and exterior applications with minimal grout lines. Some clients and even design professionals can get confused over the difference between ceramic tile and porcelain tile products. The process and materials to create both types of tiles are essentially the same. The difference really lies in the quality of the raw materials used. Compared to ceramic, porcelain clays are cleaner, whiter, and higher quality with less impurities. This makes the raw materials a little more expensive, but overall the final product cost is still very competitive. The higher-quality materials also allow for more finish options, including through-body coloring, specialty patterns, and even high-quality unglazed tiles. Building on a long history of creating porcelain tile products, some manufacturers in Europe and the United States have developed advanced techniques to make larger and thinner porcelain tile products. Using sophisticated machinery and careful quality control, designers are no longer limited to common sizes, such as 12-inch square porcelain tiles or 18-by-7-inch porcelain planks. Instead, many more face sizes have become available, with technology now allowing for large porcelain slabs to be produced up to 63 inches by 126 inches (5 feet 3 inches by 10 feet 6 inches). That is noticeably larger than common 4-by-8 or 4-by-10 sheet good wall and floor panel products, meaning that seams and joints can be reduced even more compared to those products. Further, for things like kitchen islands, countertops, or wall surrounds, a single slab may be able to be used, thereby eliminating joints altogether. In terms of thickness, some large porcelain products are available in very thin (less than ¼ inch) profiles. However, once the material gets down to that size, it can be brittle and difficult to work with since it could be more prone to cracking and breakage. That is why many industry professionals suggest that half-inch thickness is ideal for most building applications. The half-inch material is thick enough to be strong, rigid, and durable but still thin enough to be lighter in weight than some other choices like natural stone. Further, the half-inch-thick material is commonly made so it is competitively priced. Since porcelain and ceramic tile products have been in use for some time and are fairly well understood, it is not surprising that there are industry standards for its manufacture. Specifically, ANSI A137.1:2012: American National Standards Specifications for Ceramic Tile presents voluntary standard specifications for ceramic tile. It was developed by the Accredited Standards Committee (ASC) on Ceramic Tile 108, which includes representatives from across the industry, including the Tile Council of North America (TCNA). As described by the writers, “It lists and defines various types, sizes, physical properties, and grading procedures for ceramic tile, including mosaic tile, quarry tile, pressed floor tile, glazed wall tile, porcelain tile, trim units, and specialty tile. This standard provides quality criteria for buyers, specifiers, installers, manufacturers, and the public in general. It is intended for reference or inclusion in the ceramic tile section of project specifications and contracts.” As such, this standard is a good general reference for the quality levels and criteria for porcelain ceramic products of all sizes and thicknesses. In addition to establishing physical criteria for tile for quality and strength, it also describes procedures for testing for safety, particularly when used on walking surfaces. Some additional relevant standards include ANSI A137.3: American National Standard Specifications for Gauged Porcelain Tiles and Gauged Porcelain Tile Panels/Slabs and ANSI A108.19: Interior Installation of Gauged Porcelain Tiles and Gauged Porcelain Tile Panels/Slabs by the Thin-Bed Method Bonded with Modified Dry-Set Cement Mortar or Improved Modified Dry-Set Cement Mortar. These standards provide more specific information related to large-size porcelain slabs. Porcelain tile that is only half-inch-thick but up to 5 feet by 10 feet in size can be used for a variety of building surfaces.